I've come to the conclusion that life is going to be stupidly busy for the foreseeable future so if I'm going to get any artwork done, I'm really going to have to push myself. My creative output has been ridiculously low over the last couple of years and I'm fed up with that. So, whilst working on the current (very time-consuming and knotty) freelance project, I've managed to spit this etching out in what for me is double quick time. 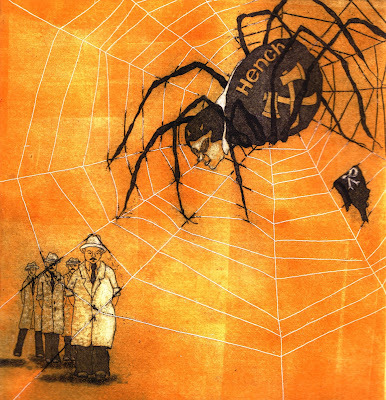 The Henchspider is companion to the Harpy and works alongside my Requires Improvement print; they all go together really and are concerned with the same themes. The things that stop us doing what we should be doing. Those who are familiar with my work over a number of years will have spotted that the Datamonger is back... It's a bit like EastEnders when old characters return... Watch out to see who else pops up from the past.